We are ranked as the finest in the list of Manufactures, Exporters as well as Suppliers of Mechanical Universal Testing Machine in India. Our Universal Testing Machine has following features which enables High Accuracy Testing â�� with Economy, Speed and Versatility. Our Universal Testing Machine is designed for testing metals and other materials under tension, compression, bending, transverse and shear loads. Hardness test on metals could also be conducted. 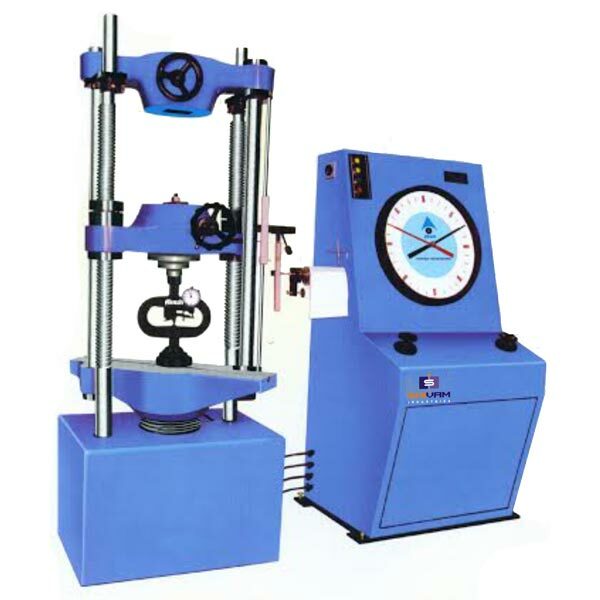 Operation of the Mechanical Universal Testing Machine is hydraulic transmission of load from the test specimen to a separately housed load indicator. The system is ideal since it replaces transmission of load through levers and knife edges, which are prone to wear and damage due to shock on rupture of test pieces. Load is applied by a hydraulic lubricated ram. Main cylinder pressure is transmitted to the cylinder of the pendulum dynamometer system housed in the control panel. The cylinder of the dynamometer is also of self â�� lubricating design. The load transmitted to the cylinder of the dynamometer is transferred through a lever system to the pendulum. Displacement of the pendulum actuates the rack and pinion mechanism which operates the load indicator pointer and the autographic recorder. The deflection of the pendulum represents the absolute load applied on the test specimen. Return movement of the pendulum is effectively damped to absorb energy in the event of sudden breakage of the specimen. This consists of a hydraulic cylinder motor with chain sprocket drive and a table coupled with the ram of the hydraulic cylinder, mounted on to a robust base. The cylinder and the ram are individually lapped to eliminate friction. The upper cross-head is rigidly fixed to the table by two straight columns. The lower cross-head is connected to two screwed columns which are driven by a motor. Axial loading of the ram is ensured by relieving the cylinder and the ram of any possible side loading by the provision of ball setting. A displacement elongation scale, with a minimum graduation of 1 mm is provided to measure the deformation of the specimen. Tension test is conducted by gripping the test specimen between the upper and lower cross heads. Compression, transverse, bending, shear and hardness tests are conducted between the lower cross head and the table. The lower cross head could be raised or lowered rapidly by operating the screwed columns, thus facilitating ease of fixing of the test specimen. The control panel consists of a power pack complete with drive motor and an oil tank, control valves, a pendulum dynamometer, a load indicator system and an autographic recorder. The power pack generates the maximum pressure of 200 KGF/cm. The hydraulic pump provides continuously non â�� pulsating oil flow. Hence the load application is very smooth. This system consists of a large dial and a pointer. A dummy pointer is provided to register the maximum load reached during the test. Different measuring ranges can be selected by operating the range selection knob. An overload trip switch is incorporate which automatically cuts out the pump motor when the load range in use is exceeded. This unit permits selection of favorable hydraulic ratios producing relatively small frictional forces. Pressurized oil in the loading cylinder pushes up the measuring piston proportionately and actuates the special dynamometer system. The piston is constantly rotated to eliminate the friction. The dynamometer system is also provided with an integral damper and ensures high reliability of operation. The load transmitted to the dynamometer is transferred through a pendulum to the load indicator. This unit is of the Pen & Drum type and is supplied as standard. The horizontal motion of the pen produces the load ordinate of the diagram and the drum rotation produces the extension ordinates, in the ratio of either 1: 5 or 1: 10. Universal Testing Machines are closely controlled for sensitivity, accuracy and calibration during every stage of production. Every machine is then calibrated over each of its measuring ranges in accordance with the procedure laid down in British Standard 1610: 1992 and IS: 1828 â�� 2005 Part 1. Universal Testing Machines comply with grade â��Aâ�� of BS: 1610: 1992 and class 1 of IS: 1828: 2005 parts 1. An accuracy of + 1% is guaranteed from 20% of the load range to full load. Below 20% of the selected range, the maximum permissible error is 0.2% of the full reading.